Fred Everything Interviews House Legends Satoshi Tomiie & Matthias Vogt. Fred: Hi Satoshi, Hi Matthias. First of all, I wanted to thank you for your new EP, Love Unlimited on Lazy Days. Very nice EP indeed. Can you tell me first of all how did the project come together? Matthias: First of all I have to say that I am still thrilled to work with Satoshi. Tears is such a seminal track for me! Satoshi is an amazing producer/dj/label-maker, I feel honored to be a part of this. Thanks to the internet (was it the good old Myspace way back then?) – anyway, somehow we got in touch, and Satoshi and Hector signed two tracks that i did for their N.Y.C. based SAW.RECORDINGS label. I loved the remix Satoshi did for “The Emerald Sky”. Finally we did a gig together in Frankfurt – we randomly planned to jam a bit together. It didn’t work, but the gig was super cool and we decided to work together on an EP via internet, some New York-Frankfurt ping-pong. That worked so well, thanks to all the ways of modern communication and producing. When i heared Satoshi’s latest tracks, for example the ep on Systematic, I knew my way of hand-played melodies and harmonies would fit perfectly into his minimal and tasty analogue-feel framework. Fred : You are both trained musicians, something rare in the world of electronic music. Can you tell us a little more about your other musical projects? Matthias: Yes, there are too many! :) I even started two new brand new alter egos, Mias Void for more abstract techy stuff, and Frankfurt Soul Project for – well, the slower soulful tracks. Plus a new collaboration with two super talented guys from Frankfurt, free improvised music, this project is called A Coral Room. And yes, besides being a dj and producer I play the piano and do arrangements and song-writing. But I kind of always did that and never had a proper masterplan. Stuff happens while you have other plans… I did five studio albums as the musical director of [re:jazz], mainly jazz versions of electronic originals (on the Frankfurt based INFRACom! label). There’s even versions of a Ryuichi Sakatmoto track (Bibo No Aozora) and a version of Satoshi Tomiie/Frankie Knuckles’ Tears we did. Plus many albums and countless releases with Motorcitysoul or my Matthias Vogt Trio. But now, after so many years in the business i think it’s time to finally focus on putting out stuff under my own name mainly, currently working on the very first Matthias Vogt album – it’s almost there. Fred : I can feel a Detroit influence to the EP. What were your main musical influences for this EP? Matthias: This Detroit thing is there automatically when i start to think about a track. It has been a major influence for me since i started producing. Generally speaking I try not to think when i am creative and put together new tracks, it has to be spontanious and not top-heavy. But of course, Jazz and Soul are two other important influences. Live hand played elements, without pushing the quantize button. Modern timeless dance tracks with music in it. Satoshi: Similar to Matthias, I start a song by just vibing the grooves with spontaneous ideas and normally they take me to the right direction. All has to be natural and I feel really good about what we made together on this EP. The reason we named the track Dialogue, it was really a musical dialogue between him and myself. Listening what he played on his keys and I responded with some drums, percussions and my beloved JP8, vice versa. Talking about live hand played elements, DCB is not working on JP8 at the moment, I am not as good player as Mathias but this time I was forced to play all by hands which might have made it more ‘home style’. I like it. Fred : What made you choose Lazy Days as the label to release this EP? 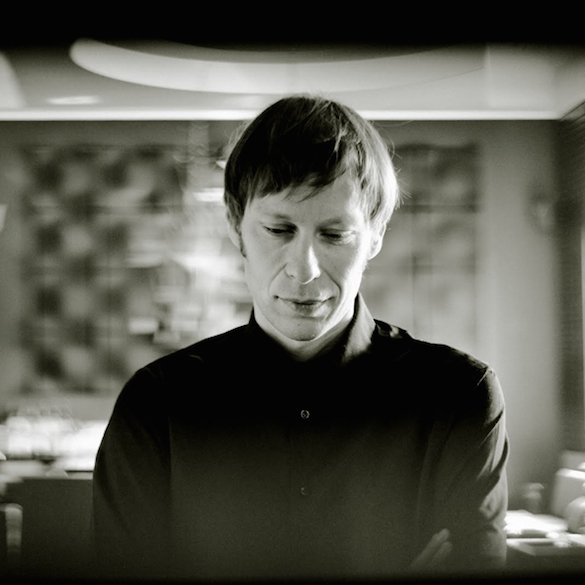 Matthias: I already had two releases on the label, one as Matthias Vogt and the “Barrique EP” with Ian Pooley, as M.V.I.P.. I knew Lazy Days would be open minded for my collaborations, as the M.V.I.P. EP worked really well, plus we had to find a label which would dig the wide genre range of the tracks, as it is both, deep and jazzy house on the one hand (“Dialogue”) and harder clubby detroitish techno on the other hand (“Love Unlimited”). I knew it would be doing great with Fred Everything and Lazy Days. Fred : Any plans on a future collaboration together? Matthias : Nothing new started yet, but of course, why not? Working with Satoshi is good fun! Thanks Matthias & Satoshi for the words of wisdom and Traxsource for the platform! 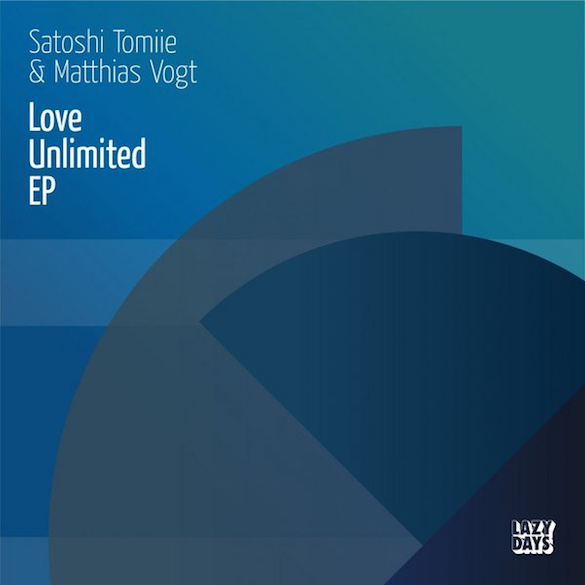 Lazy Days Recordings latest release ‘Satoshi Tomiie & Matthias Vogt – Love Unlimited EP’ out now on Traxsource.